Shortly before I started writing this blog, I got married to the most beautiful and amazing girl in the world, my best friend and my soulmate – Mrs Scot 🙂 As you all know by now, we live in the UK; but being the non-stereotypical couple that we are, we didn’t want to get married here! We wanted an idyllic beach wedding in a 5-star hotel, where an elephant delivers you flowers down the aisle. The one where you have your closest family and friends there and not the relatives that you have to make awkward small-talk with! 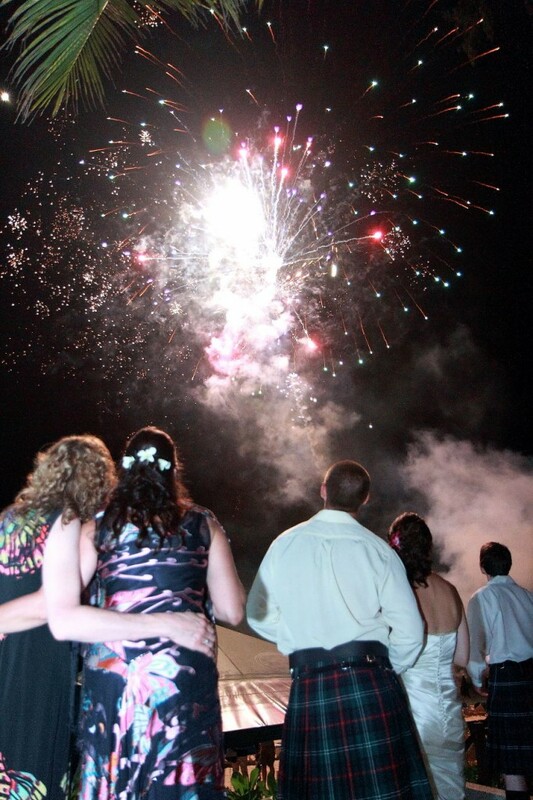 The one where you have fireworks on the beach and dance in-and-out of the warmest water in the world….. 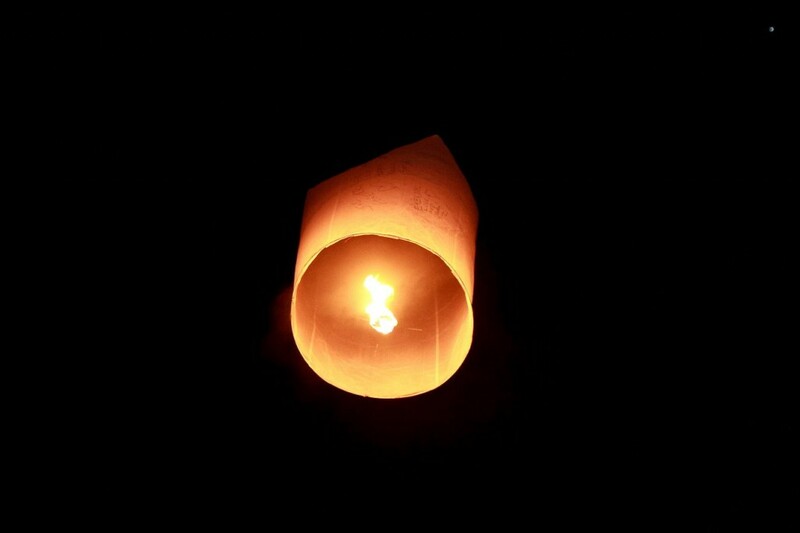 The one where you close the night by setting off lanterns with your dreams written on them into the starry sky. We did all of that. I’m serious. We had an elephant, we had our family and friends, we had fireworks, lanterns and a band. We had the best food we have ever tasted. We had some awesome flowers and we had 3 dedicated wedding planners. We had 2 professional photographers and a professional videographer for the whole night. And what’s more, this cost a LOT less than getting married here in the UK. A heck of a lot less. I would recommend getting married abroad to anyone, it was the most amazing day of my life. What’s more is that nobody will ever forget our wedding because (although I say it myself) it was truly amazing. I have hundreds of photos that I would love to show you all (but OUCH that would blow my cover) that are simply out-of-this-world and furthermore, we had two weeks holiday with some of our favorite people in the world. I am a big fan of simplicity. I like to keep things easy to understand and concise. I think the best way to share our experience with you all is to give you a brief (bullet) version of how we planned our wedding. We gave everyone notice immediately. We sent out ‘save the date’ cards almost a year in advance to give everyone enough warning of our (slightly crazy) plan and set up a wedding website for reference. Being the Engineer that I am, I made up a spreadsheet (got to love a cheeky spreadsheet) of costings – a different worksheet for each hotel. Through books that Mrs Scot was reading and other research; we established what we should buy in Thailand and what we should buy in the UK. 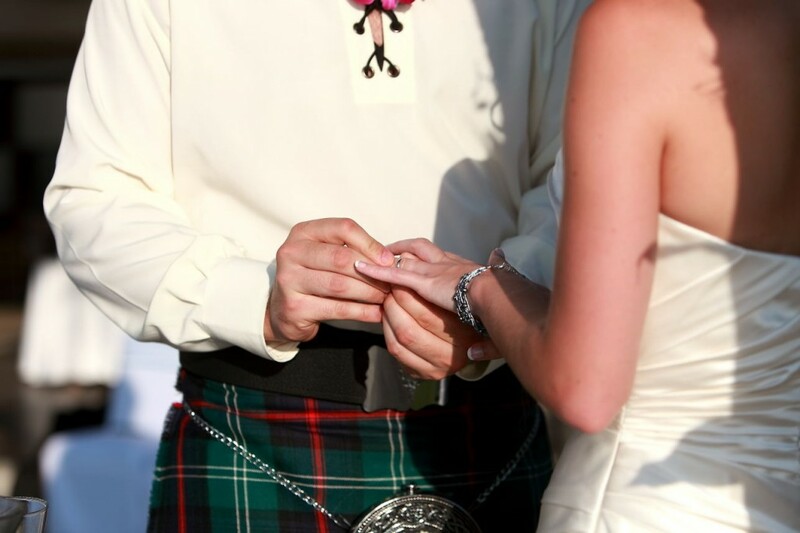 The Dress (for obvious reasons) was a must, so Mrs Scot found her perfect dress in Edinburgh. This was flown out from the UK. 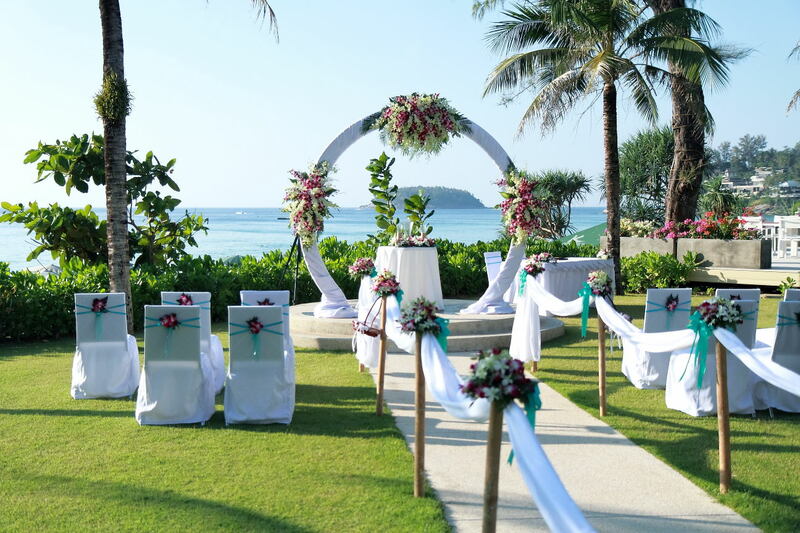 We planned our summer vacation 2011 to Thailand so that we could schedule a trip to the short-listed hotels – we had pre-planned a meeting with the wedding planners at the hotels. We met with the wedding planners and took a tour of each place and reaffirmed our (already) chosen venue. They showed us videos of previous weddings, layouts, decorations, flowers, diagrams, plans, maps etc. etc. The rest was easy. Seriously. We had a team of 3 wedding planners as part of the package. We exchanged numerous emails on cake requirements, decorations, menus, flowers etc. They did everything for us and never got frustrated. We sent them pictures of what we wanted things to look like and they pulled it all off! I will leave you with a few photographs. If anyone is interested in the finances behind it all – Stay tuned. It looks beautiful. 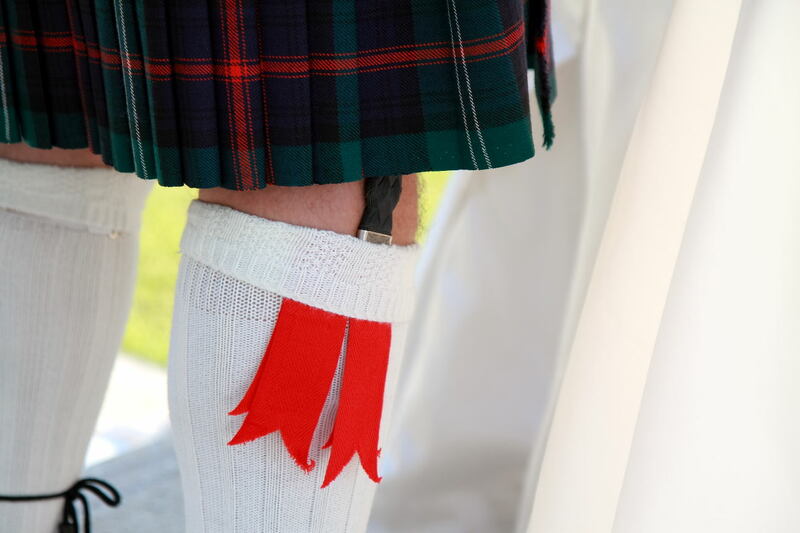 I’m glad you went with your heritage and wore the kilt! Thanks 🙂 – haha I thought you might be 😉 – I will follow this up with a finance post this week! What gorgeous wedding photos! Destination weddings have been a popular choice among some of my friends too, although being from central Canada, either Las Vegas or Mexico are the top choices, with the Dominican Republic in there too. They can be fairly inexpensive, plus you get the added bonus of a beautiful tropical vacation! [email protected] Budget Big Dreams recently posted..HGTV, We’re in a Fight! Wow, I love the picture of you two at sunset! Thank you for sharing your story – I’m looking forward to see the breakdown of the costs. My boyfriend and I are planning on hitting up cuba soon to visit possible venues to get married! 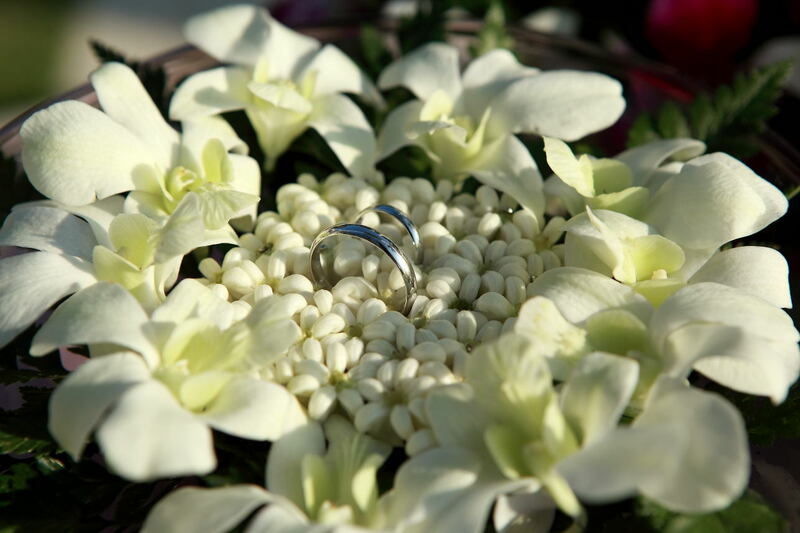 I think it’s great that the hotels have a wedding planner for you – it takes a load of stress off the bride and groom. I do have one question: Did you pay for the guests to come to the wedding? I read somewhere that it’s wedding etiquette to pay for their flight and/or hotel rooms. We did not pay for the flight or hotel rooms because we simply could not afford it.. however we did insist on no gifts from the friends that flew all the way out. Hello! Your wedding looks fabulous! We are planning summer 2014 on Phi Phi Island. I wondered can you reveal the hotel? The only thing that I am worried about is a hotel wedding feeling like your on a ‘conveyer’ belt? did you have this problem? Hi Laura… Glad you like it – thanks for the compliments! If you are on Phi Phi ensure you don’t go near the Phi Phi Sand Seaview – it is horrendous!!! Hi I came across your blog whilst doing some research on Thailand weddings. Can I ask where and what hotel you got married or where to reccomend? And how you arranged the planner ? Thanks a lot. Photos are beautiful. Hey Jem! The hotel was called The Katathani… if you are interested shoot me an email at mail (at) savvyscot.com and I can answer any specific questions. The planners etc. were all included as part of the package! I really like reading about this post re: your nuptials in Thailand. How many guests did you have? Did you all stay at the same place? Also could you give a range of how much money did you spend for this wedding?– not to intrude your privacy but please help give a range estimate. We’re thinking 50-60 people in 2016. We only had 20 guests so it was quite intimate! We all stayed at the same place (not the place we got married as it was too expensive). All in, it was around £10K which included dress, our 2 flights out there from the UK and accommodation. Feel free to email me directly (mail (at) savvyscot.com) if you have anymore questions. I am planning my thailand wedding as we speak! I am looking for five star resorts around the same area. I’d love to know what resorts made your short list and where you actually stayed. I need to make a decision very soon as we are planning to marry in April 14′. I’m about to read part 2…thanks! Hey Chantal! We did it in the Katathani on Kata Noi beach. What hotels are on your short list? Hi Scott, looks fab mate! did you do the whole embassy thing when you were in Bangkok we are planning our wedding for feb14 but this part is massively confusing would love a wedding planner to meet us over there and guide us through it all! Hi Scott, thanks for your blog and am about to hop over and read the financials. I’ve also made a spreadsheet and was weighing up whether to use a local wedding planner BUT Xy!!! I’m an EA by trade so think I should be able to organise things especially if the resort is great and one does their research. Am awaiting price back from The Tubkaak Krabi Boutique Resort, however would also be keen to hear your short list and what you thought of them upon site inspection? We were also thinking of heading over for a holiday 12 months prior and would rather spend my $$$ on that than a local wedding planner. I couldn’t have explained our wedding as brilliant as you have our was mirror image but unique to us.We had fire dancers, fireworks a dj we even had a led bar that changed colour instead of a boring flat table that was looking more like a garage sale with drinks on. I stumbled on the blog because I was just looking around the net seeing if couples are still getting hitched in Thailand and what the trends are as well as the cost of a wedding in Thailand rather than at home. And it is still cheaper even when you hire a wedding planner like we did It was stress free even with legalising our marriage with another great company . I would certainly recommend Thailand Koh Samui it was fantastic our family’s were blown away just by letting them see for themselves not all romantic weddings are held in a church. I hope this will encourage others to see the world and what it has to offer. Hello Scott, it looks fabulous companion! you did when you were all embassy in Bangkok we are planning our wedding for feb14 but this part is massively confused’d like to meet us there for a wedding planner and guide us through it all! Beautiful photographs and a lovely intimate ceremony.